However, in reality the expression is: “Jack of all trades, master of one.” When this expression is misquoted it would seem to present the idea that humans may know a little about many things, yet not a lot about any one subject. This expression APPEARS to be a wise insight concerning division within the body of Christ; however, we must safeguard those things which SOME might consider nonessential, understanding that everything in God’s Word is there for a reason, and therefore essential; if God wanted it communicated to man. Scripture is void of the concept that one can be a Believer, and then become a nonbeliever; any more than a person could be a fruit producer, and then be someone who has never produced fruit. There are many different analogies utilized in God’s Word that indicates that either a person is saved, or they are not saved, and that there is not a progression from one to the other, from unsaved to saved, from goats to the sheep, from children of the devil to children of God. The word “saved” does not reflect a singular, one time experience, solely completed in the past going on in its results. Let me speak personally, if I may. I was raised in a denomination which taught that the believer could lose their salvation (a denomination which held to a mixture of what some would refer to as Calvinism and mostly Arminianism – I do not use these terms and recording to myself are others belief systems, it is Christ in Christ alone who is our point of reference, not men in their own presuppositions and teachings; no matter how sincere they are. Therefore, I refuse to allow others to control this conversation and distort it by breaking it down to either being the teaching of one of these two individuals. These pastors lived 1500 years after Christ, and to attempt to utilize their teaching in order to maintain the simplicity and remembrance of these issues is incorrect and unbiblical. We should address Biblical doctrine based upon Biblical doctrine, not the interpretations according to man. There are things that are correct and things that are incorrect in both of these men’s teachings; and I will not be forced into a corner to support or reject either one. It is to Jesus, and Jesus alone, as seen in His Word; that I stand concerning who is my absolute authority. And it is the Holy Spirit that is my guide based upon God’s Word, not some interpretation that men like to lay on the Biblical subject matter which only muddies the water.). “So when they had dined, Jesus saith to Simon Peter, Simon, son of Jonas, lovest [agapao= “highest regard”] thou me more than these? He saith unto him, Yea, Lord; thou knowest that I love [phileo= “affection”] thee. He saith unto him, Feed my lambs. He saith to him again the second time, Simon, son of Jonas, lovest [agapao = “highest regard”] thou me? He saith unto him, Yea, Lord; thou knowest that I love [phileo= “affection”] thee. He saith unto him, Feed my sheep. He saith unto him the third time, Simon, son of Jonas, lovest [phileis/phileo= “affection”] thou me? Peter was grieved because he said unto him the third time, Lovest [phileo= “affection”] thou me? And he said unto him, Lord, thou knowest all things; thou knowest that I love [phileo= “affection”] thee. Jesus saith unto him, Feed my sheep.” (John 21:15-17). Feeding sheep refers to leading & teaching disciples / the local church, even if the pastor is lacking. email. I’ve got some ideas for your blog you might be interested in hearing. Either way, great website and I look forward to seeing it improve over time. DELETED URL – Are you referring to the same Lutheran church that ordains homosexauls? Thank you very much for taking the time to respond concerning this article. As you can tell from the length of this article and the citations and references listed that I made a great commitment in thoroughly presenting evidence concerning my assertion concerning the fact that the Bible teaches what many have referred to as eternal security. First let me ask you to please present evidence concerning your first paragraph which I find that I am at complete odds concerning. Please refer to individuals if you would, otherwise all you’re doing is presenting hearsay which holds no credibility, and is the kind of thing that I used to run into as I was raised in the church that taught the humanistic belief that man could lose his salvation. I say humanistic because when I first became a pastor I used to run into individuals that became so emotional over this issue pointing out how it was not justice that a backslidden Christian could get into heaven just as they did. They displayed their own envy that someone can live in such a sinful matter and not have to pay a penalty for it, they displayed a humanistic way of thinking about. Where in reality, a carnal believer lives a very miserable life while in sin and there is a price to be paid, God is not mocked. The problem that I have is that everything that you present after the first paragraph is subjected, rather than biblical. Whenever I used to talk to people and I used the Greek language of the Bible, and the biblical citations; especially as much as I did in this article, many times the only thing that those that felt I was wrong could do was go subjected – calling it common sense. However Gary, you are not the author of truth and neither am I concerning the issue of salvation that God grants in His grace to those that he would choose to do so; it is God that produced the Bible. It is the Bible alone that you and I are to use in discussing this, and any other issue related to God. It is apparent you did not read the article, which is dishonest of you in attempting to challenge it – you read it to know what it says, and therefore retort correctly. I would please ask you to read the article fully, please – then explain to me what is wrong. It is the Greek grammar of the New Testament (the Textus Receptus is what I use, the same Greek manuscript used for that King James – Authorized version) that makes these points I present, not my presupposition such as you have done. Too my people who call themselves christians (how many tares will be surprised on that day) are to lazy to study God’s Word. The reason I say “call themselves christians,” is because a christian does the work of his master – and causing carnal believers to grown in doubt rather than faith – they do NOT the work of God. Over 35 years ago I began as a minister and pastor who taught that you could lose your salvation, and it was not until I was willing to see what God’s Word really had to say on the subject, and studied the original languages that I came to understand that I was wrong, as you are now. If you would’ve read what I wrote you would understand that there are many tares out there that claim to be born-again that do not have eternal life, perhaps such as the individuals that you referred too. 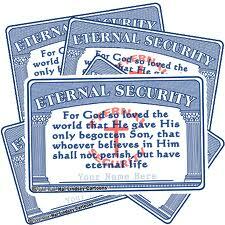 My comments concerning eternal security only to do with the true child of God, and I nor you know who they truly are. Remember Jesus response to those that did miracles and prophesied “in his name,” He said He did not know them, not that they did not know Him. So please read the whole article and see what God’s Word says, not what I had to say about it. And if you wish to continue this conversation I would ask that you provide the evidence concerning the first paragraph regarding the church fathers. You see I heard the same remarks many years ago, yet no one could ever tell me beyond individuals such as Origen, and Clement of Alexandria (origin did not believe in the atoning death of Jesus Christ or the literal interpretation of the Bible, and both may have been Gnostics) ever making such rash statements, because to do so would indicate their lack of Greek grammar within the New Testament or their own heresies which these men I believe practiced. And concerning your concluding statements, I am not a Calvinist and I resent anyone that would imply I was. I adamantly disagree with much of this teaching; and find that anyone that attempts to fight against the biblical teaching of eternal security by stating its Calvinistic present a straw-man scenario. I follow Jesus Christ, not Calvin, not Arminian theology, or even the confinements of dispensationalism. We need to think for ourselves based upon what God’s Word says. I can tell you from my experience as a pastor, teacher, and chaplain; that one of the most effective tools of the devil that makes Christians ineffective due to a lack of growing in faith, is the belief that they can lose that which God alone gave them. A person that constantly thinks only of themselves, and fears that they are going to hell, while at the same time this questions the integrity of God and his ability to keep them; these individuals do not grow in faith. And if you’ve taken the time to read any of my articles you’ll see that faith is not a tool to get things; it is a relationship of believing that God is in total control of our lives especially when that makes no sense. Eternal security does not downplay the fact that a person must respond in faith, yet even that faith is a gift of God, as a salvation is. You or I is not saved by faith! Read Ephesians 2:8 again, we are saved by grace; God’s unmerited favor, wherein the only way we have access to this grace is by exercising faith. Is heretical to say that we are saved by faith, because this would mean that we are trading faith for salvation, which is a works based theology and will a person to hell. His grace and always grace, even to those that think that they are doing so good as believers; those that concentrate on the outside of increasing in pride – spiritual pride; yet void of the humility that we all should have. And please quit making rash assertions that this teaching is a license to sin. If you would’ve read my article you would’ve heard how much I had to say about the terrible consequences of sin in a believer’s life. If you understood the Greek you would understand that the bema seat of Christ is also a seat of judgment. Use a Greek Interlinear you will see that Pontius Pilate was sitting on a bema seat as he judged Christ; as well as Herod, and Festus concerning them judging Paul. The bema seat of Christ is a place that many Christians will feel regret as they are reminded of all the carnal things that they did on this earth as opposed to growing in Christ and gaining the mind of Christ (there will be no tears in heaven, different subject then the Bema Seat Judgment of Christ – God is not mocked).